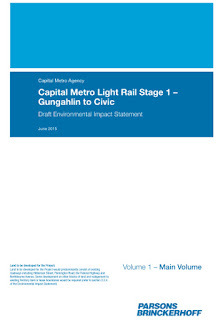 The ACT Government has released a mammoth 1600 page draft environmental impact statement on the Capital Metro light rail between Gungahlin and Civic. It is a comprehensive examination of the impact that light rail will have along the corridor and covers many different areas. The Canberra Times has two reports - one quite informative and balanced here, and another focussed on the negative aspects here. The second talks up the minimal savings in time that drivers will experience as a result of having mass transit as an alternative option, and also the loss of a car park (that is scheduled to be sold anyway). Construction depots take over London Circuit carpark near the courts; site of visitor information centre on Northbourne Avenue, carpark opposite Exhibition Park. About 60 truck journeys a day in 2017 and 2018 (36,000 movements across the two years); 7800 truck movements in 2016. Standard construction hours 7am till 6pm Monday to Saturday; major intersection work, overhead wiring and oversize deliveries done outside standard hours. Construction to use 74,000 cubic metres of concrete, 3.4 million litres of diesel, 9500 tonnes of asphalt, 100,000 metres of PVC ducts, 3000 tonnes of steel for rails, plus 9300 more for reinforcement and structural work.860 trees removed. Construction to employ an average 500 people, up to 900 at peak times. Weekend closure of key Northbourne intersections at Macarthur/Wakefield; Mouat/Antill; Barry Drive/Cooyong; Alinga (closed Friday 10pm til Monday 4am, adjacent ones not on the same weekends). Other intersections to be "sporadically closed" for up to two or four weeks, with diversions. Bus routes using the corridor and running across the corridor periodically disrupted. 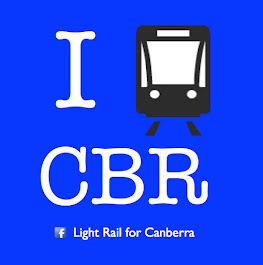 Light rail vehicles operate Monday-Thursday 6am-midnight, Friday-Saturday 6am-1.30am; Sundays 8am midnight. Light rail vehicles every six minutes at rush hour, every 10 minutes 9am-4pm, every 15 minutes other times. Journey time 25 minutes Gungahlin to the city. 14 Light rail vehicles, each up to 33 metres long, with dedicated space for four bicycles. Top speed 70kmh. Platform at each stop 33 metres long, capable of extension to 45 metres for extended vehicles; signalled pedestrian crossings to nearest footpath. Light rail corridor 7 metres wide, widening in places to 10.4 metres, including outbound and inbound Light rail lanes and median strip. Light rail replaces trunk and express bus routes on Northbourne Avenue, the Federal Highway and Flemington Road. An extra southbound lane to be built from the Barton Highway to Antill Street, 630 metres long. Road changes include banning of turning across the median in some locations, including: Exhibition Park entrance, the Kamberra Wine Company on Flemington, the Yowan Golf Club on the Federal Highway, the netball centre on the Federal Highway, the southbound right turn from Northbourne Avenue to Bunda Street. Seven electricity substations to be built along the route, each in a 12m x 4.5m building, at: Gungahlin depot, Flemington Road, Collaroy Street, Vicars Street, Barton Highway, Macarthur House and Mort Street. This draft EIS is a very useful document, It informs the likely disruption that construction will cause, and enables businesses along the route to plan accordingly. With the Majura Parkway almost complete, much truck traffic will have shifted off Northbourne already. It also looks at issues such as the lack of familiarity that local drivers and pedestrians have with large light rail vehicles rumbling along, and proposes an education campaign to familiarise Canberrans with their new transport infrastructure. Health and socio-economic impacts form part of 17 broad topics discussed in the environmental impact statement. The report is designed to identify "worst case scenarios" to mitigate potential problems before construction of the proposed stage one development of the 12-kilometre tram route between Gungahlin and the city. The document says key issues were impacts to heritage, noise and vibration, planted trees, landscape and visual, traffic and transport, social and economic, and property and land use. The EIS also sets out problems and mitigation strategies for biodiversity, air quality, contamination and soils, utilities and services, hazard and risk and bushfire, among others. The 1700-plus page report, put together by Parsons Brinckerhoff with ACT government data, has been in the works since last October. A public consultation period is now open with several public sessions planned to gather feedback and provide further information.